It will be 110 years ago tomorrow in Tacoma, Washington that Bing Crosby was born. While there has been some dispute over the year of his birth (some sources give 1904, including his tombstone in Holy Cross Cemetery in Los Angeles, California), his baptismal certificate gives 1903 as the correct year of his birth. Regardless, Mr. Crosby would go onto become one of the biggest stars of the 20th Century. Indeed, although Bing Crosby is still famous today, I suspect most people under 60 don't realise just how phenomenally successful he really was at the height of his career. Bing Crosby was a superstar on the same level as Frank Sinatra, Elvis Presley, and The Beatles. He remains one of the biggest selling recording artists of all time, with over half a billion records sold. He also had an extremely successful career on film and later television. Although today he is best known for his biggest hits (particularly "White Christmas") and the "Road to..." pictures he made with Bob Hope, in the mid-Twentieth Century there were very few artists in any media who matched his success. What makes Bing Crosby all the more remarkable is just how long his success actually lasted. As a recording artist he had his first hit in 1927: "Muddy Water" with Paul Whiteman. His first number one would come the following year in the form of "Ol' Man River", once more with Paul Whiteman. His recording career would last literally decades. In fact, his last real hit would occur several years after his death, the duet "Peace on Earth/Little Drummer Boy" with David Bowie. Recorded for his final Christmas special in 1977, it was released as a single in 1982. Over his years as a recording artist, Bing Crosby had 41 number one hits. He also had at least one single chart every single year (usually more) between 1931 and 1954. If this is not impressive enough, one must consider that Bing Crosby still has the biggest selling single of all time worldwide. According to The Guinness Book of World Records "White Christmas" has sold over 100 million copies when every one of Bing Crosby's versions are counted. After its initial release "White Christmas" would re-enter the Billboard charts an astounding 22 times. Music historian Joel Whitburn of Billboard determined that Bing Crosby was the most successful recording artist of both the Thirties and Forties. 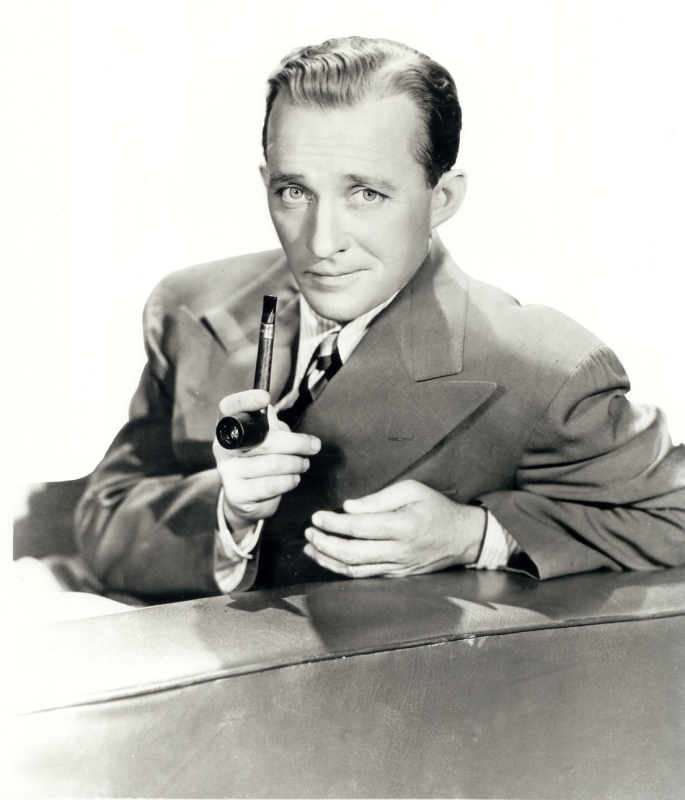 Of course, Bing Crosby was not simply a recording star, but also a film star. Bing Crosby made his film debut as one of the performers in the musical revue King of Jazz in 1930. His first major film role would come just two years later in 1932 with The Big Broadcast. In the film Mr. Crosby plays a very fictionalised version of himself, a singer more interested in enjoying himself than his career. In all Mr. Crosby would appear in some way, shape, or form in over 75 feature films, from 1930 to his final appearance on film in a cameo in Bob Hope's 1972 film Cancel My Reservation. Such was Bing Crosby's success in film that he ranked in Quigley's box office poll of the top ten stars for fifteen years. What is more, for five years (1944 to 1948) he was the top box office star. While many of Bing Crosby's films are no longer well known, a surprising number of his movies are still famous to this day. Holiday Inn (1942), Going My Way (1944), White Christmas (1954), and especially the "Road to..." films he made with Bob Hope are still well known to the general public. Quite simply, Bing Crosby is one movie star from the Golden Age whose films even people beyond classic film buffs have seen. Beyond his recording and film careers, Bing Crosby also had success on both radio and television. He made his debut on radio in 1931 as one of the regulars on The Radio Singers on CBS. Mr. Crosby received his own radio show on 2 September 1931 on CBS. It would continue through various title changes and changes in network (it was on CBS, NBC, and ABC at various times) until 1955. In addition to his own show, Mr. Crosby also appeared on such radio shows as The Screen Guild Theatre, Command Performance, Duffy's Tavern, and, as might be expected, The Bob Hope Pepsodent Show. On television Bing Crosby would repeat the success he had on radio. His first television special aired on 3 January 1954. Disliking live television, Mr. Crosby's appearances on the medium actually increased as live television gave way to film and videotape. In fact, he was the host of the first videotaped television programme in the United States, the TV special The Edsel Show, which aired on 13 October 1957. Over the years he made numerous television specials, and his Christmas specials became an annual event. He was also a regular guest on television specials and variety shows from the Fifties to the Sixties. He appeared on such shows as The Ed Sullivan Show, The Tonight Show, The Carol Burnett Show, Rowan and Martin's Laugh In, and The Flip Wilson Show. He was a frequent host on ABC's variety show The Hollywood Palace, hosting the show no less than 32 times from its debut in 1964 to its final season in 1970. He also had his own short lived sitcom, The Bing Crosby Show, in the 1964 to 1965 season. Bing Crosby continued to appear on television until the year he died, 1977. In fact, he taped his final Christmas special, Bing Crosby's Merrie Olde Christmas, only five weeks before he died. Bing Crosby's impact on television would extend beyond that of a performer. His production company Bing Crosby Productions produced such shows as Ben Casey and Hogan's Heroes. In addition to his achievements in recording, film, radio, and television, Bing Crosby would also be partially responsible for an important development in the postwar recording industry. Mr. Crosby preferred recording his radio shows to performing them live, but unfortunately the recording techniques of the day were inferior to broadcasting a programme live. It was then in 1947 that Bing Crosby invested $47,000 in Ampex, the company that would develop the first American reel to reel tape recorder. Bing Crosby then became the first radio performer to record his programmes using reel to reel recording technology. Not only would Mr. Crosby begin recording his songs on Ampex reel to reel tape recorders, but he gave one of his own Ampex Model 200 recorders to guitarist Les Paul. In turn, Mr. Paul would invent multitrack recording. Although today many only know Bing Crosby as the man who originally sung "White Christmas," Bob Hope's partner in crime in the "Road to..." films, and the star of such classics as Holiday Inn and Going My Way, he was actually one of the biggest stars of the 20th Century, one whose stardom actually cut across several media. He would prove to be a huge influence (in some cases the primary influence) on a whole generation of crooners, including Frank Sinatra, Perry Como, Dean Martin, and Tony Bennett, as well as musical artists as diverse as Elvis Presley and The Beatles (whose hit "Please Please Me" owed a good deal to the Bing Crosby song "Please"). His presence is still ubiquitous in Anglophonic pop culture. Quite simply, Bing Crosby will still be remembered when many modern day pop stars have long been forgotten.